The South Portland payment technology firm continues this year's rapid growth. "Healthy volumes, strong international growth and higher fuel prices all contributed to our performance being ahead of expectations," says Melissa Smith, Wex's president and CEO. South Portland-based payment technology firm Wex Inc. reported strong growth in the third quarter, with revenue up 18 percent from a year earlier and net income up 53 percent. Increased fuel prices contributed to the payment processor’s growth, along with increases in customer transactions across its three major business units: fuel, travel and corporate services, and health and employee benefits, according to a quarterly earnings statement issued Wednesday. “Healthy volumes, strong international growth and higher fuel prices all contributed to our performance being ahead of expectations,” said Melissa Smith, Wex’s president and CEO. Smith said another significant factor in the growth was the signing of new agreements with major fuel producers Shell and Chevron. Wex reported revenue of $382.7 million for the third quarter, up 18 percent from $324 million for the third quarter of 2017. Of the $58.7 million revenue increase, $17.8 million was the result of higher fuel prices, it said. The company reported quarterly net income of $95.4 million after adjusting for one-time credits and charges, equivalent to $2.19 per share, which was up 53 percent from $61.5 million, or $1.43 per share, a year earlier. The company’s unadjusted net income for the quarter was $53.7 million, or $1.31 per share, up 66 percent from $34 million, or 79 cents per share, a year earlier. According to the investor website Seeking Alpha, Wex’s adjusted net income beat analyst expectations by 7 cents per share, but its unadjusted net income fell short of their expectations by 19 cents per share. Also on Wednesday, Wex announced that it has signed an agreement with JCB, the leading issuer of payment cards in Japan. In an interview, Smith said the deal allows Wex customers to use the company’s electronic payment services at more locations in Japan, where many merchants do not accept Visa or MasterCard. 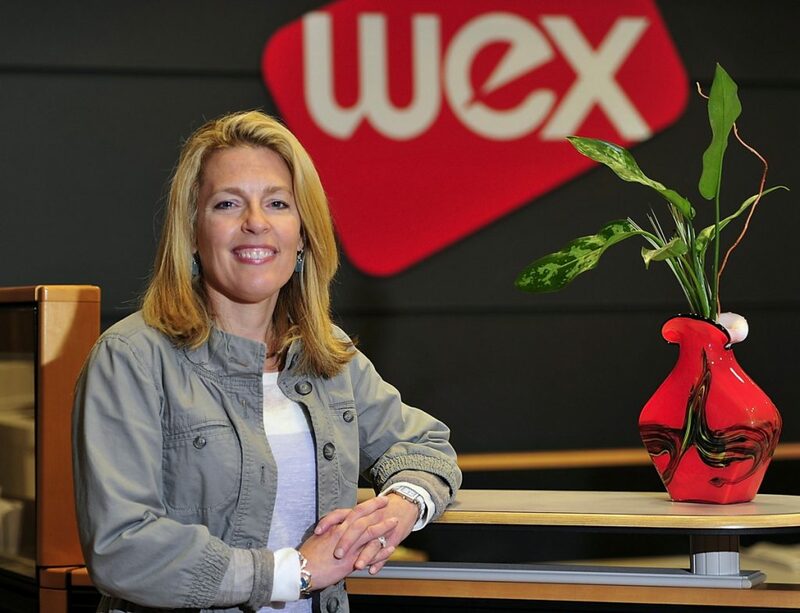 Wex has about 1,050 employees in South Portland and 3,500 worldwide. One of just three non-bank publicly held companies in Maine, its shares trade on the New York Stock Exchange under the symbol WEX. Its share price was up by about 5 percent to $176 in the first 90 minutes of trading Wednesday following the earnings release. Wex plans to relocate its headquarters to a new office building in downtown Portland in the first quarter of 2019. On Wednesday, Smith said the headquarters relocation project is on track, and that she is pleased with the look of the new building. “I like the fact that it looks modern, but I also feel like it blends into the area so it doesn’t look like it’s totally standing out,” she said.